There is a known issue when using an sqlite database on an ext4 filesystem. You will want to remount the filesystem without barriers (-o barrier=0) in order to speed up the operations of the database. For more information, please see http://phoronix-test-suite.com/pipermail/trondheim-pts_phoronix-test-suite.com/2009-March/000095.html. Be sure to include the specified fields included in the example bcfg2.conf file. These can be specified in either /etc/bcfg2.conf, if it is readable by the webserver user, or /etc/bcfg2-web.conf. Any database supported by Django can be used. If you are not using sqlite (the default choice), please see the Notes on Alternative Databases section below. If you are using an sqlite database, the directory containing the database file will need to be writable by the web server. The reason for this is that sqlite will create another file for its journal when it tries to update the database file. Distributed environments can share a single remote database for reporting. The recommended statistics plugin is DBStats. To use it, add it to the plugins line in your bcfg2.conf. Alternatively, the Statistics plugin can be used in conjunction with a crontab entry to run /usr/sbin/bcfg2-admin reports load_stats. Reports no longer needs to be installed at the root URL for a given host. Therefore, reports no longer require their own virtual host. In order to make this work, you will need to specify your web prefix by adding a web_prefix setting in the [statistics] section of your bcfg2.conf. This configuration is suitable for use with the default installation from an RPM or deb package. 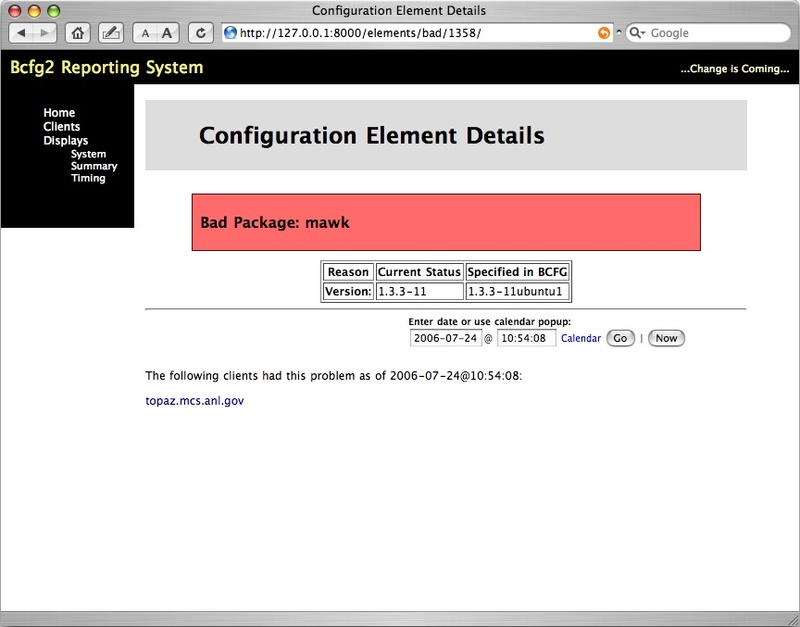 At this point you should be able to point your web browser to http://localhost/bcfg2 and see the new reports. The ability to look at a Calendar Summary with past statistics information. More recent data concerning hosts. Additional information display in reports. Primarily, reasons for configuration item verification failure are now accessible. Instead of static pages, pages are generated on the fly, allowing users to drill down to find out about a specific host, rather than only having one huge page with too much information. The bcfg2-admin tool provides management and maintenance capabilities for the reporting database. A few useful Django commands are provided as well. load_stats: Load statistics data from the Statistics plugin into the database. This was importscript.py. scrub: Scrub the database for duplicate reasons. 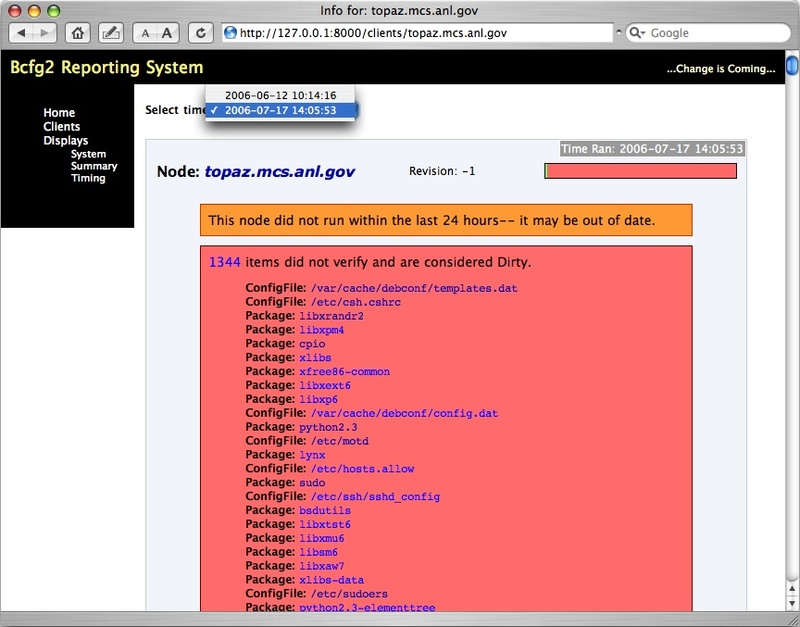 update: Apply any updates to the reporting database. Unlike the syncdb command, this will modify existing tables. syncdb: Create the tables for any models not installed. Django will not modify any existing tables. sqlall: Print the sql statements used to create the database. Note: This does not show the fixture data. validate: Validate the database against the current models. 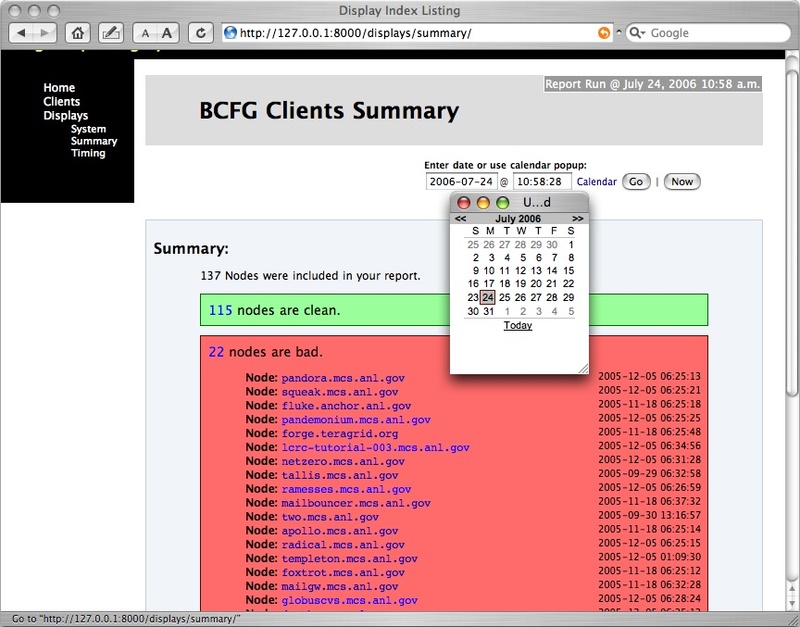 bcfg2-reports allows you to retrieve data from the database about clients, and the states of their current interactions. It also allows you to change the expired/unexpired states. The utility runs as a standalone application. It does, however, use the models from /src/lib/Server/Reports/reports/models.py.